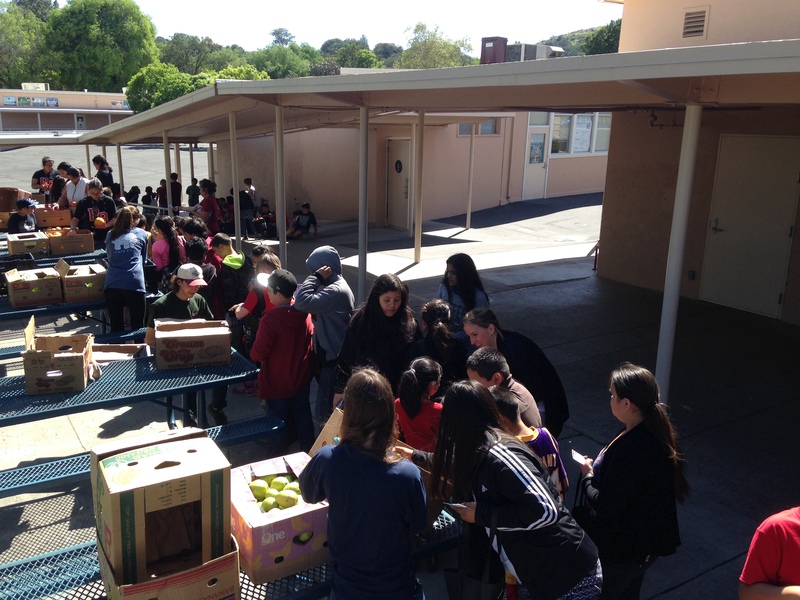 GleanSLO staff is often asked how our gleaned produce is distributed. There are many answers to that question, which includes more than 100 monthly distributions county wide and direct distribution to Food Bank Partner Agencies. This month we wanted to focus on one unique type of distribution where gleaned produce is going out to our county’s hungry residents. We interviewed Food Bank Children’s Programs Manager Heather Donovan to give some insight on the Food Bank’s Children’s Farmer’s Market Program, which helps distribute our gleaned produce—on the same day as the harvest in some instances—to children at select county schools where 60 percent or more of students qualify for free or reduced lunches. The program has been a great success and it’s a delight to hear stories from Heather about kids getting excited about the specialty crops we harvest such as beets and spaghetti squash. Tell us a little about your role and how you got started in the Food Bank Children’s Programs. I am passionate about nutrition and believe in the importance of good nutrition starting at an early age. I was so excited to join the food bank team and especially as the Children’s Programs Manager. I oversee the food bank programs for 18 years and younger, which includes our after-school snack program, summer meals, summer breakfast bag, and children’s farmers market. What is a Children’s Farmer’s Market and how many of them are there in San Luis Obispo County? 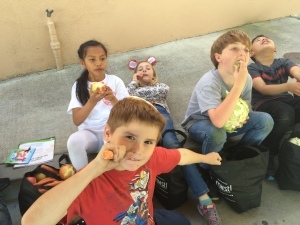 Every child leaves our farmers market with 10-15 lbs of fresh fruits and vegetables, but this program is also an interactive and enriching experience. At our market sites, the older children are the “vendors,” who sell the produce to the younger kids shopping at the market. Each child is given ten “food bank bucks” to purchase 8-12 different types of fruits and vegetables. 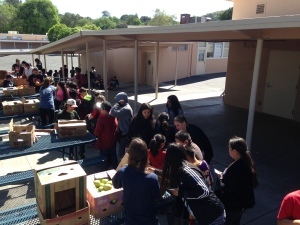 The kids are picking and buying the produce by themselves, which gives a sense of ownership. This feeling of pride makes the kids excited to take the produce home to their families, cook with it, and eat it! Our nutrition education team comes to the markets to provide a tasting, recipe, and lesson, incorporating produce being provided at that particular market. We also play educational games, including the “mystery box,” where a child reaches their hand into the box and has to guess what fruit or vegetable is in the box without seeing it. We currently have 16 markets throughout the county, with shoppers in pre-school to high school. Are there other programs like this outside of SLO County? If so, where and how are they different? Other food banks have markets for children, however with the kids as vendors, “food bank bucks,” nutrition education team, educational games, we have put our own unique twist on the children’s farmers market program! How many children do these markets serve on a monthly basis? We have over 1,200 kids who participate in our children’s farmers market program each month. 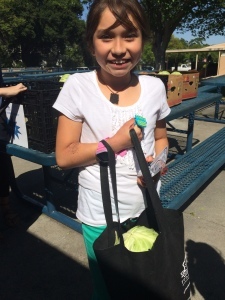 How does GleanSLO produce fit into the Children’s Farmers’ Market Program? 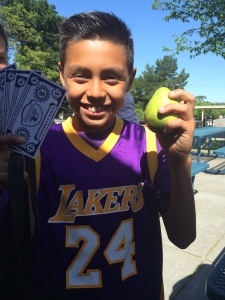 GleanSLO provides the more unusual produce for our markets that really gets the kids excited and asking questions! From different kinds of persimmons, bok choy, and spaghetti squash just to name a few, some of the kids are not accustomed to seeing these produce items in their homes. This allows us to educate the children on the unusual fruit or vegetable from how it was grown, how you prepare it, and most importantly letting the kids taste it. The kids go home with the fruit or vegetable they learned about and can then talk to their parents about it, opening up a conversation about fruits and vegetables. Have there been any particular gleaned items that the children really enjoy or prefer? In the fall, we had Cinderella pumpkins, which were a huge hit! They were heavy for the kids to hold, but that did not stop anyone. Do kids really get excited about gleaned beets and radishes?! The kids get especially excited about anything they haven’t seen before. Items like gleaned beets and radishes are something different. They kids want to learn more about the unusual produce item. Why are these types of distributions important in our county or society? It is important to introduce and educate children about the many different types of fruits and vegetables. We encourage kids shopping at the market to try new things and to take a little bit of everything home. Having conversations about the importance of eating a variety of fresh foods is important to start early on. Children who participate in our markets have shown an increased consumption of fruits and vegetables, contributing to their overall health and well-being. This entry was posted in GleanSLO Interviews, Uncategorized on 05/03/2016 by gleanslo. Meet Kylee Singh, our newest Steering Committee member. Persimmon Cookies by Raw Food Betsy!